If this is the first book you found while searching for a book to read next, then the first thing you should know is that this next-to-last book is what you should put down first. Sadly, this book presents the next-to-last chronicle of the lives of the Baudelaire orphans, and it is next-to-first in its supply of misery, despair, and unpleasantness. Probably the next-to-last thing you would like to read about are a harpoon gun, a rooftop sunbathing salon, two mysterious initials, three unidentified triplets, a notorious villain, and an unsavory curry (goodreads.com). Unlike the previous book, this one moves the plot a little further forward. The Baudelaires actually make it to Hotel Denouncement and by the end of the book the know where a lot of secret information is stored and where to find the Sugar Bowl. Upon arriving at the Hotel they come in contact with many of their former acquaintances and caregivers including Vice Principal Nero, Mr. Sir and Charles, as well as Hal, Jerome, and Justice Strauss. While at the hotel they are required to pose as concierges in order to gather information about the people staying there. However, they are eventually found out and after a horrible accident they are locked up and required to attend a trial. Nothing ever turns out the way it is supposed to so they end up figuring out how to escape the trial by following the one person they want nothing to do with, Count Olaf. The book ends as they make their escape from the Hotel before any of them can be apprehended by the authorities. There is quite a bit that goes on in this book, but as usual I don’t want to give too much away. Some important information is revealed; however, never enough to satisfy the reader after so many books. Everything we really want to know is still undiscovered. 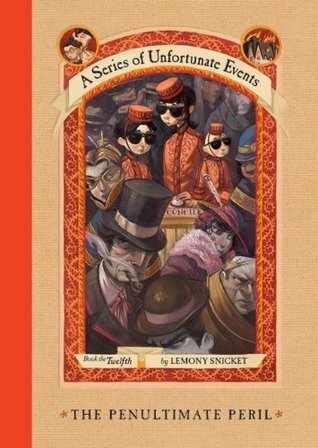 With only one book left I hope everything gets solved, the Baudelaires story can be told, and Count Olaf finally arrested. With such an unfortunate series however I do not have much hope for this. The plot moves along at a great pace just like the other books and, except for a few instances, was quite enjoyable and entertaining. The parts that I didn’t enjoy were ones that could have been written differently, maybe a bit shorter, to make them more interesting. They were a little too long-winded in my opinion. Just about every character we have come across in the series so far shows up somewhere in this book. I suppose the only new person in the book is Dewy Denouncement who is the keeper of some very important information. Eventually, he reveals himself to the children and this part is pretty interesting because he explains some more things about V.F.D and where some documents are being stored for their safekeeping. The Baudelaires have started to change a little. They are standing up for themselves more and taking matters into their own hands since they realize that no one can help them or believes their story. I really hope they figure everything out! The writing is about as good as all the other books. I suppose after reading so many back-to-back I have become bored with the writing style, but children will most defiantly enjoy it since many of the explanations they will not understand until this point.